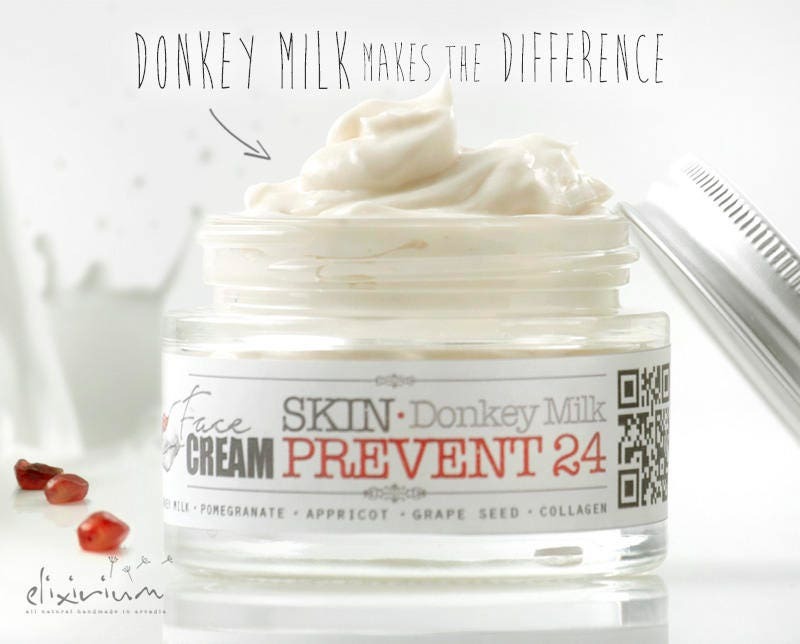 SKIN PREVENT 24 Donkey Milk Face Cream with Pomegranate • Organic Face Elixirium for 24h aging prevention, skin elasticity and tightening. • Hydration Elasticity & Tightening 24 hours a day for all skin types. 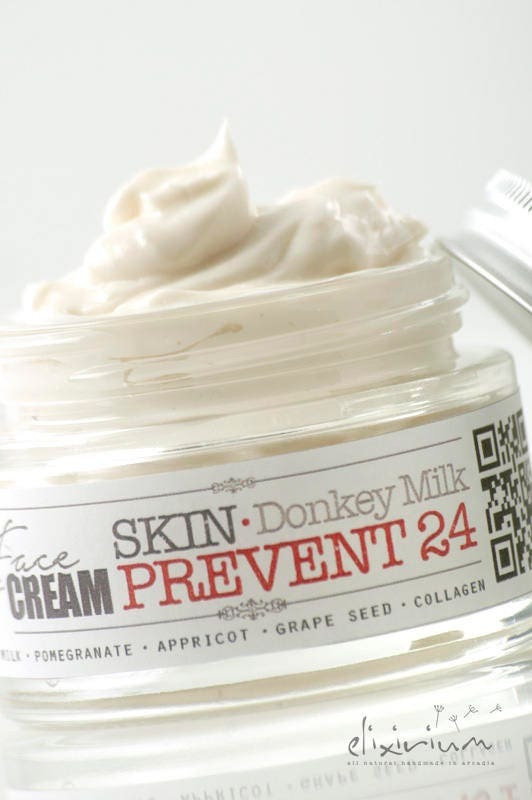 • Donkey Milk, Pomegranate, Collagen, Grape seed and many more powerful organic, active ingredients. ► DETAILS : It is a true story that prevention is so much better than cure. Skin aging is a long process. The sooner we start to deal with it the better the results would be. Caring for our skin hydration and elasticity should ideally start before the first signs of time. 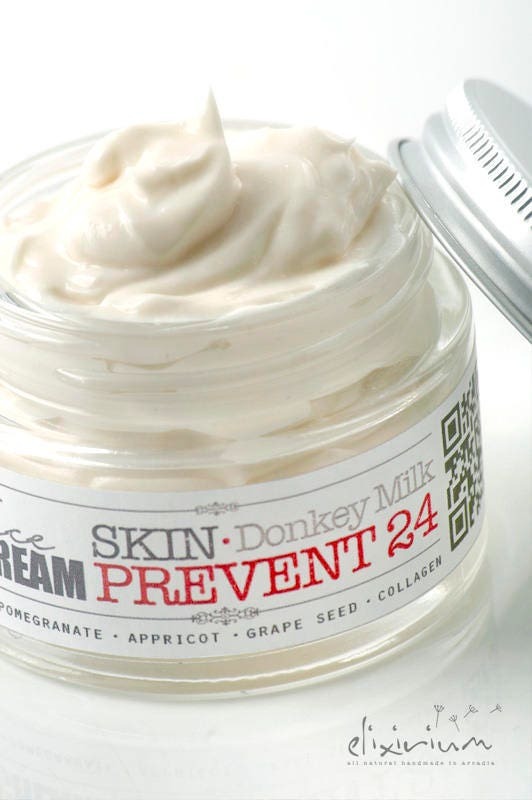 Elixirium's PREVENT 24 is an organic day cream, based on top of the line natural ingredients like Donkey Milk, Collagen, Pomegranate, Grape seed and Appricot oils. All these incredible ingredients create a unique formula, active for 24h a day, which is aiming in a single target : Skin Aging Prevention ! This is achieved by balancing the 3 fundamental key areas of skin aging : Skin hydration, skin elasticity and skin tightening. Daily use of the cream during your morning beauty routine assures for a 24 hours shield against skin damages and premature aging. Cleopatra's beauty secret was bathing in Donkey milk for silky soft skin every single day and Hippocrates recommended it for numerous health & skin conditions. Rich in omega 3 & 6 fatty acids, vitamins & minerals to regenerate the skin and reduce wrinkles. Mild composition makes it ideal for sensitive, dry skin types and skin conditions like psoriasis and eczema. Rich in phospholipids, ceramides and proteins, it promotes long lasting skin hydration. Pomegranate except of a delicious treat, is also an extremely benefitial ingredient when it comes to skin care. Pomegranate extract and seed oil, so rich in fatty acids and high in antioxidants, have outstanding moisturizing, anti inflammatory and anti aging properties. Their high levels of antioxidants challenge free radicals, promotes collagen and elastin production and keep your skin from aging too quickly. Nutrient-rich grape seed oil is so rich in polyphenols. These polyphenols are anti-inflammatory antioxidants known to retard the aging process and prevent acne outbreaks. 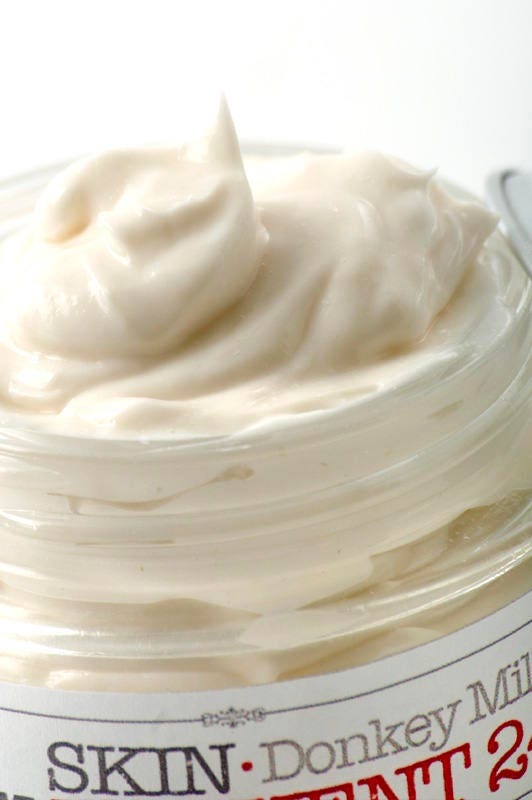 ► INSTRUCTIONS : Use a small amount of cream during your daily morning beauty routine. Apply with circular movements. Very effective on moisturizing my dry skin. I love the smell, it’s very delightful. The ingredients are very beneficial. The only thing is that it’s a little hard for it to absorb on skin. This is a good cream, but it gives my face a greasy finish. I have a dry mature face. Don't say old! I never wear make up so I don't have any thing to take up the feel. Arrived in perfect condition.